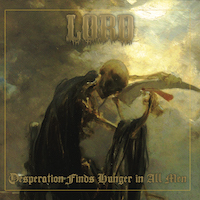 Lord is a name that is quite widely used by bands of the metal genre, there are several other American bands with this name and I have previously reviewed an Australian band with the same name, this is the fourth album of this American band and it is called Desperation Finds Hunger in All Men. I have been listening to it for a while and come to some conclusions, one of those is that the album is a bit on the long side and that it may not be happening very much through this long time. On the subject of the music it isn’t easy to describe, it is heavy, a bit dark, little bit slow, sludgy, a bit monotonous, and the growly vocals are not very good. Decent production but not something that stands out. They do try to make something of their own and it isn’t easy to describe but it still feels like something I have heard before, it doesn’t really stand out and doesn’t feel very exciting. It is a 65 minutes long album split on ten tracks where several pass the eight minute mark, I think the dynamics would have been helped by shorter and more distinct tracks. Really heavy stuff and really poor vocals are my lingering impressions of this album. I think they deserve much credit for trying their own thing; they just don’t manage to make an interesting album. It feels long and dragged out and I think that it lacks depth and dynamics; it just isn’t very exciting to listen to. And it lacks standout songs that make me want to return to the album and in the end I find myself not being overly impressed with what I am hearing. Darker and more dynamic could have been a method to improve the spectacle, better vocals and more depth are other things that I believe would have benefitted this album. There are some who think this album is good, I have seen some positive reviews for it so if you are liable to like that sort of music it might be worth looking into. But from my standpoint it isn’t a very exciting album and I do believe that many would agree with me regarding that. So Lord gets a plus for being imaginative but in terms of quality and a music fan’s desire to really listen they need to shape up a bit.